As I said in my last post, I’ve got the figures I need for Conquest ready. However, after a couple of games of BBDBA I’m not sure what armies to take. I had a game of BBDBA last month. I won in the centre and lost on the flanks. Last Friday I had my second game, this time I took Gauls with a Spanish ally. 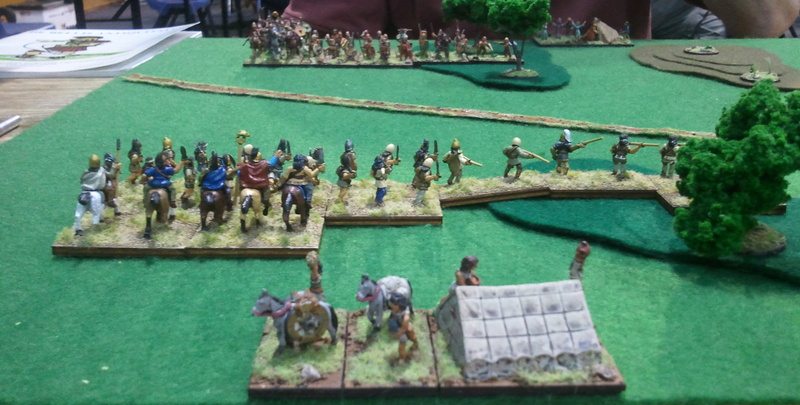 Nick went Early Imperial Romans to see how I’d cope against knights. I didn’t take any pictures, which was a pity, as it was fun game. I won decisively on one flank (I was the defender and laid out a few woods and a difficult hill). However, much like in the previous game, I lost elsewhere. This time, however, it was that I’d effectively fielded two commands against one Roman one, but the C-in-C was up against two commands, and had also put three elements of LCh on the far side of a wood; these were badly outnumbered, and could not get away from the place. Even though I lost, I learned a bit more about BBDBA — my commander died when he rolled a 1, but he should have used his single get-out-of-jail +1. This reprieve might have been allowed me to turn things around, though I doubt it. His command broke, and the other two were too slow or too far away to redeploy against the remaining Romans. What this taught me is that BBDBA is very different from DBA. Breaking a command is only a good start; you have to find a way to be able to redeploy to repeat the exercise. Choosing what commands are mobile and what commands have the most PIPs is crucial for this. My choices for Conquest are (1) the Marian Romans with Numidian allies, (2) the Gauls with Spanish allies, or (3) later Carthaginians. 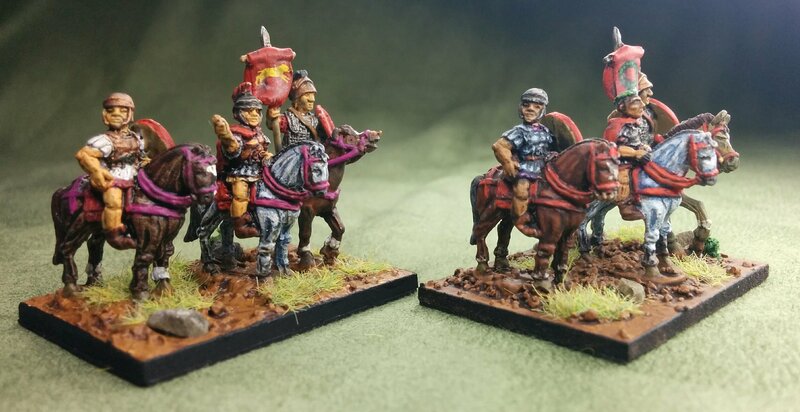 After looking at what I hope to achieve, which is largely have an excuse to use the newly painted figures, I think the last of these is the best choice; I can use the new Spanish 4Ax, the new Gallic 4Wb, the new Gallic Cv and the new Numidian LH. I can also take 36 elements of Carthaginians (although some of the Spear do look a lot like they may be Greek or Campanian mercenaries). One of the advantages of the Carthaginians is they are aggression 4, so they should get to deploy second (and if they don’t they can do a littoral landing to mess with the opponent). My initial reluctance with this army was my concern about the Carthaginians as a DBA army, but I think it’ll do OK. That just leaves the choice of my medieval army. I was thinking of going Prefeudal Scots; I then thought about the Komnenan Byzantines, which have been my default choice for a while. However, I’m now thinking of a more eccentric choice — North Welsh with a South Welsh ally. It’s very fast and should bring on a result in no time at all! I could even look at constructing narratives for the Carthaginians and Welsh having gone to sea as a background to their battles; somewhat more violent versions of the voyages of Hanno and Madog! I’ve finished the last of the figures I needed to get done for my trip to Conquest in two weeks time. These are a command element for my Marian Romans, and four elements of Gallic cavalry. The Roman command is to replace the one I have of Julius Caesar. I’ve called the commander Quintus Labienus, the only one of Caesar’s legates who did not follow him over the Rubicon. Labienus was not only a brilliant commander, but also probably a man of principle; his decision to fight for the republic rather than his commander in Gaul is likely to have been taken out of a sense of loyalty to the concept of the republic; the idea he was a client of Pompey is reductive. I’m not sure I’m entirely happy with this element. 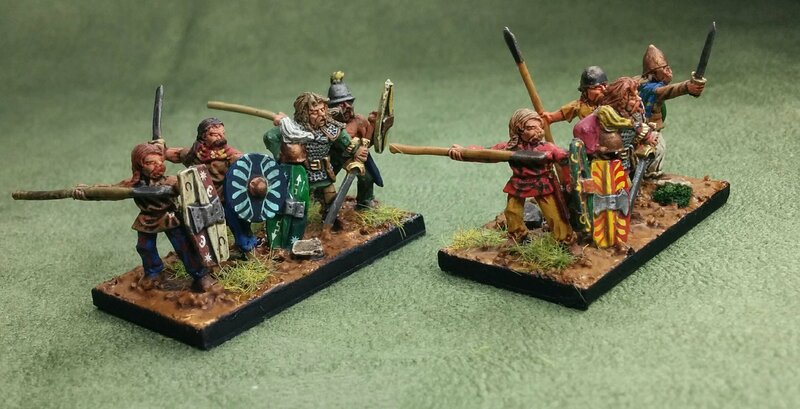 They are all Freikorp figures, but the standard bearer is a giant next to the earlier figures. Nevertheless, I look forward to using Labienus rather than Caesar! The four new elements of Gallic cavalry took quite a while to get done. At the last minute I found another figure to allow me to do four elements, rather than have a HotT hero. It involved using a figure from my Ancient British LH that are orphans until I get some more 3Wb; the horse was left over from an element of Carthaginian cavalry, which was fortuitous. These were hard to fit on the bases. Both the CB and the Xyston figures are a bit animated. Keeping ‘hands inside the bus’ hasn’t entirely worked, especially on the sides of the elements. However, I’m pleased with the way the Xyston figures look amongst the Corvus Belli ones (and with the news that CB will be back in production again. These elements will allow me to field Gauls as mercenaries and auxiliaries in other armies, and to use them for BBDBA. Finally, I’ve added a corpse for Androgeus, one that he got the head he’s standing on for. Androgeus and the decapitated Roman. The head is now not so drained of blood. Fresh blood from the Freikorp corpse. Next up may be a Campanian army, or I may start on some 1:1200 Langton ancient galleys. I’m keen to start doing some naval warfare. Then again, Nennius wants a corpse for his head too! 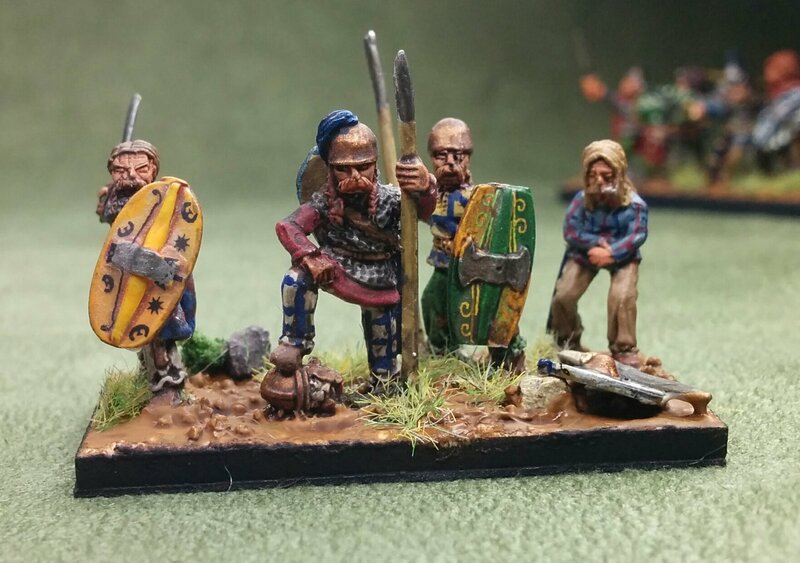 Gallic warband redux, now with added panache! 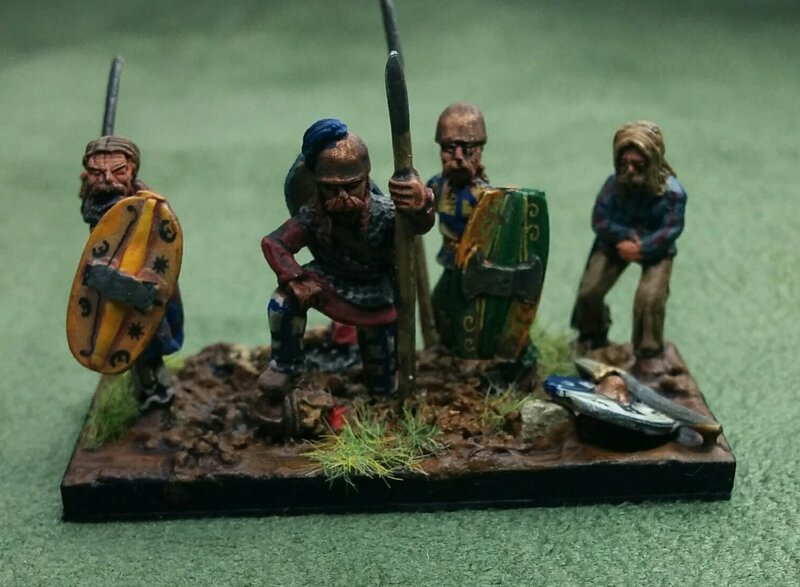 The new look Gallic warband. 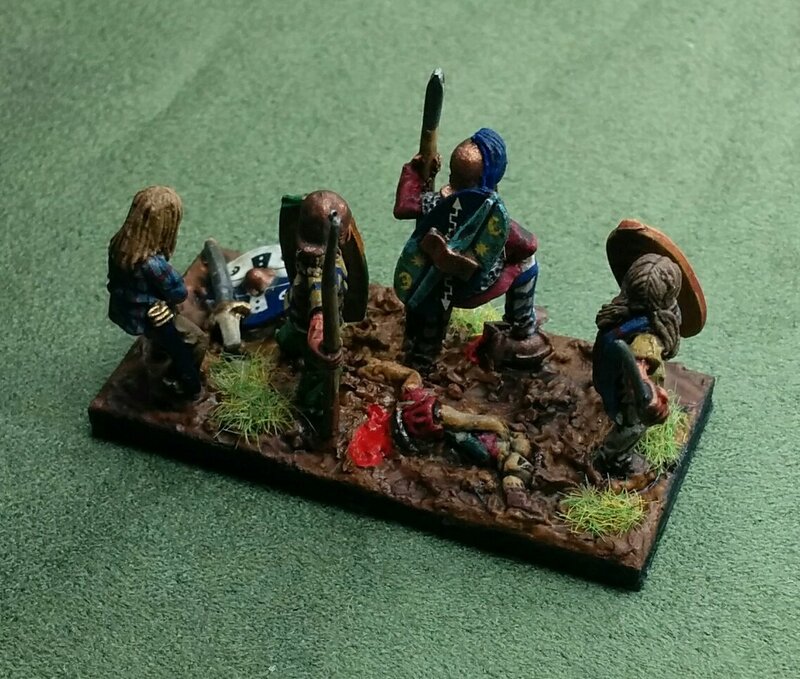 The last of my rebasing projects has been completed. The remaining elements to paint for my Romans and Gauls are new ones. I’m really pleased with how the mixing of Xyston and Corvus Belli figures has turned out. When I saw the Xyston figures I had to give them a try; they had the essential ingredient for a warband figure — panache. I could see each of them being the armoured leader and focus of an element, and I think they’ve done that. The elements now combine figures from three different painting times, and the change in quality is noticeable. The first lot of Gauls had some pretty heavy wash on them; the next lot were lighter, and the last is even lighter again. I still feel I’m a bit hit or miss with the cloth colours I use; this time I did them last, but still ended up with an odd pink instead of a slightly faded red; I probably have the recipe for what I want somewhere, but I went with my ‘bit of everything’ approach and used it in the hope the wash would improve the colour. The redoubtable Androgeus does not deign to share an element with a Xyston noble. Only one element does not have any Xyston figures; instead it has two figures from the CB Victory and Defeat pack. The noble standing on a severed head already has too much panache to have a rival on his element. He even has a name, Androgeus, so as I needed one more figure for the numbers I used a figure who looks very unwell. Whether he is queasy at the sight of the head, or has had too much pre-battle beer, I’ve not decided. If I wasn’t in a hurry I could have added a decapitated Roman corpse behind the noble. I may yet do this. The two nobles with crow-helmets are rather spectacular; not only do they have large boulders to glower over, but the hats add to their height considerably. They have the ancient equivalent of the propeller-hat (an image that is detrimental to their panache). One is now clearly the commander of the Wb command element, even though the old commander is still on the element. Let’s hope there’s no friction between the two of them. There are a pair of nobles being very nonchalant with their helmets in their hands (the Xyston sculptor may be a heavy metaller with the amount of hair these guys have!). I added a shield rested on their leg too. Lucterius on the far right. The noble pointing his sword at the enemy exhorting his men to attack is very fine. One of them has Lucterius on his element, so I expect great things! Lucterius earned his name in a single-handed defeat of Romans in the great Dumnorix revolt. He also looks like a Roman out of Asterix in Britain. The last noble also has a very fine hat, but it’s not crow-hat fine! Rebasing is a chore, but when the result is an enhanced effect, I don’t mind so much. In this case, I feel I have achieved that, and been reminded of how much I like my Gauls; I’ll have to make sure I have an excuse to get Nennius and the other naked headhunter out as well (how did he not acquire a name? Clearly I need to read more Geoffrey of Monmouth!). The naked headhunters, more work for rebasing if I choose. I’ve not kept up with reporting games I’ve played. Part of the reason for this is because I’ve only got a camera that is not all that satisfactory. I’ve taken better photos with my phone than with the small camera I’ve tried to use. The tripod is broken and can’t support the large camera I’d used for my gallery shots. The other reason I’ve not been active on the blog is that I’ve been too busy painting (more in the next post). Anyway, I’ve played quite a lot recently, and had some very good luck. Here are some photos that aren’t too blurry. Last month I got along to Battlecry for a day of demo DBA games. We got a bit of interest and should be running a competition next year as a result of this. We played DBA 2.2, as noted earlier on MEDBAG. My first game was against Joel, a historical matchup of my Early Seleucids against his Classical Indians. Early Seleucids face Classical Indians. The Indians up close (some are hidden behind the trees. 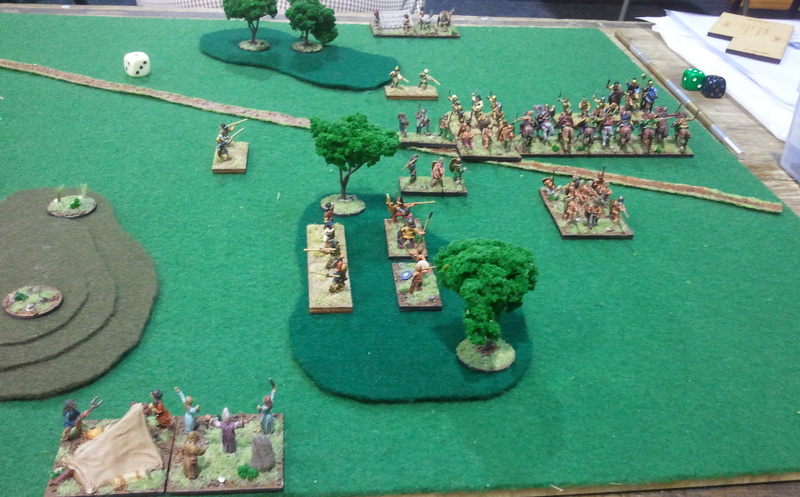 I should have been in serious trouble as the Indians came around my left flank in large numbers. However, they were obviously unfamiliar with scythed chariots, as mine proceeded to tear them to pieces. I came away with a lucky victory. Chaos on the left flank. Next I faced John, who’d just finished his Celtiberians. I used my Gauls. View from the Celtiberian camp. I managed to meet his warband with my cavalry and used this to my advantage in a battle on a narrow frontage. 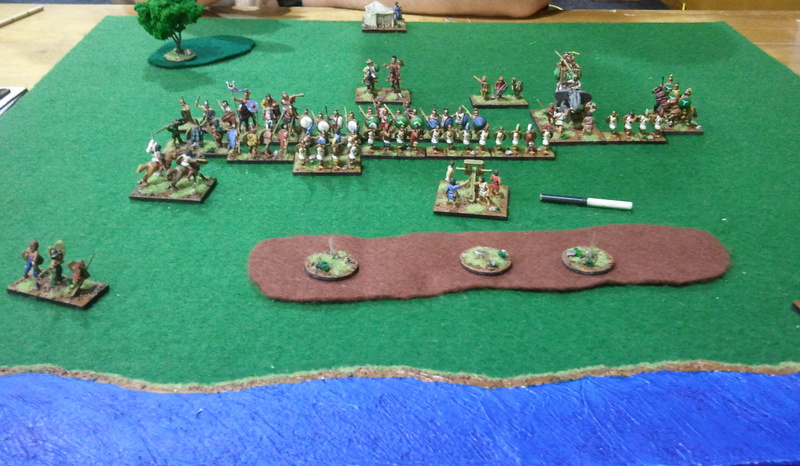 I then faced Mike, who used my Carthaginians. I took my Syracusans. As we are both littoral, this involved a waterway, which ended up to my back. Mike went for a littoral landing. I hurried to advance to reduce the potential for the littoral landing party to make trouble. I was able to sack his camp (the crucified Syracusan was a provocation!) and used my longer line to outflank his elephants. Another victory. The Tarantines return from sacking the camp. I think we played some more games that I didn’t take pictures of. The last on my camera was my Syracusans against John’s Celtiberians. I don’t remember for sure if I won, but I think my luck was pretty strong, and I used my advantage in cavalry to compensate for the vulnerability of my spear to his warband. Unrecorded is our final BBDBA game of Carthaginians and Celtiberians against Romans and Spanish. This was officially a draw, but I’m sure the Romans had the edge when we stopped. Since then, I’ve mostly played DBA 3.0. Joel’s visited after work a few times, and I’ve got to the City Guard again. We’ve had a lot of fun trying out his Aztec hordes of doom, and we tried out a number of permutations of knights against spear. From memory the time before last we played: Normans v. Anglo-Danish, Early Crusaders v. Comnenan Byzantines, Aztecs v. Prefeudal Scots and Vikings v. Anglo-Danish. I think there was an Aztec v. Early Crusaders too. Our first game was his Aztecs against my North Welsh. The Aztecs meet the Welsh. The Welsh with their South Welsh ally. The South Welsh cavalry got in the way of his archers and the spearmen got flanked; however, the Welsh had been making progress against the important Aztec elements. Next we played Ptolemy against Lysymachus. The Ptolemaic army was quite different from what I expected. I tried a littoral landing of three auxilia in a line with side edge contact with the waterway. It seemed legal and threw Lysimachus’ plans to meet this treat. I got a narrow victory in this battle. We then tried Carthaginians against Gauls. Carthaginians drawn up against Gauls. Carthaginians with a random stack of skulls next to their camp. 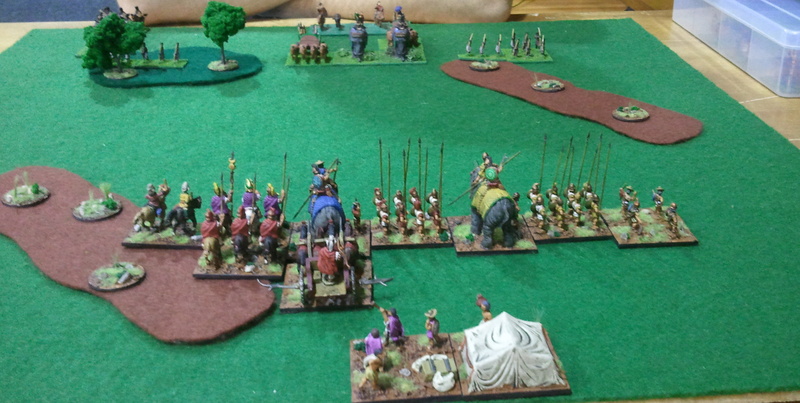 The Carthaginians won in a battle stacked in their favour (though elephants don’t quick kill warband any more). Our final battle was the Carthaginians against Aztecs. I didn’t take any pictures of this. The Carthaginians took only one elephant, I think. They were lucky in a battle between their two 2LH and the Aztecs two 2Ps. I killed both of them, but had I not, my back was to a wood, and I’d have been very much at a disadvantage. Last Sunday I caught up with Joel and John at the Auckland City Guard for some DBA. We used DBA 2.2. In the first game I got my Syracusans out against Joel’s new Carthaginians. It was a close game, but Joel pipped me 4-3. The second game we combined armies for a Big Battle DBA game: John and I led Gauls against Joel’s Marian Romans with Spanish allies. As defenders we deployed first. Our choice of open terrain in the centre with massed cavalry didn’t work. Our die-rolling was pretty shocking too – a humiliating defeat. The massed effect looked great, though, and attracted notice. I hope to get to that club regularly this year. Those games inspired me to get my paints out again. I’ve got four camps that are nearly done out to finish, and seven stands of Successor pike. On Thursday Joel came over for a couple of games of DBA 3.0. He’s played that version a lot recently. I’ve not looked at it in ages. We tried my Seleucids (ll/19d) against his Marians for the Kn-Bd dynamics. It was close, as I lost my right wing to his cavalry. My general destroyed some legionaries, but I clinched the game by flanking his foot general with my imitation legionaries. The general had pursued beyond the support of a unit on his flank. I enjoyed the pursuing blades and pikes, though I wonder about blades against knights. The second game was my Prefeudal Scots against Joel’s Vikings. This was fun as the Scots now have Fast Pike. It was a game I lost on the flanks, as my light horse failed to sack the camp. However, I’m inspired to paint a Wb general for this army pike-supported double-ranked Wb could be very nasty, though a LH and a Ps for the wings is a bit light! I liked the fast pike designation for the Scots. I’m keen to rebase my Welsh now. The 1066 period has become interesting again. Overall, I liked the way DBA 3.0 played. 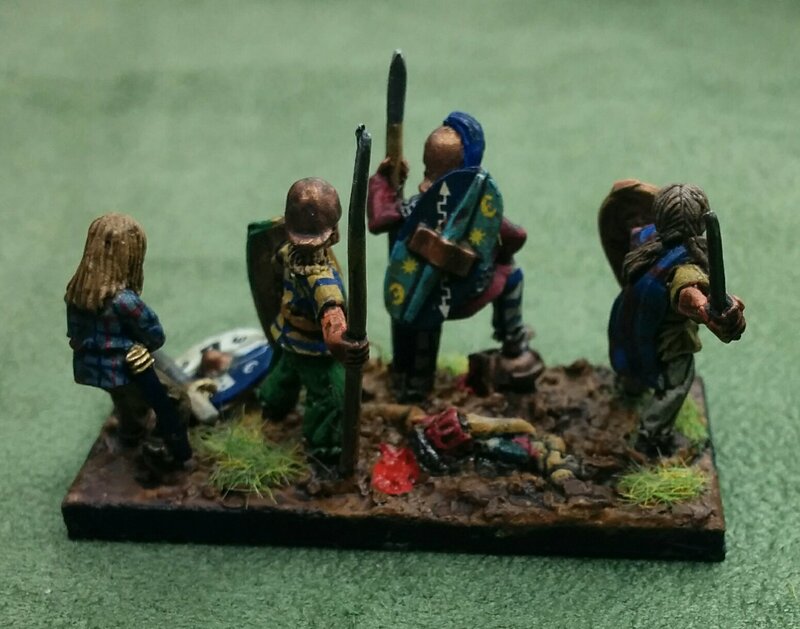 While searching out the figures for my Wb general, I got out some Normans for a SBH warband. These are Essex foot and Khurasan mounted. The painting table is getting crowded! An entire army of warband! All the Gallic foot amassed. Note how much less flock I've used on the four new ones (flanking the command); the Gauls were the first army I did with this flock; over time I've come to use less and less flock. 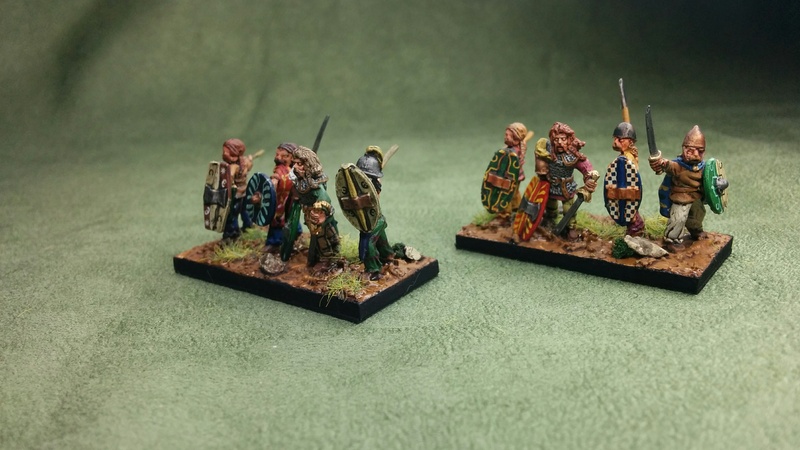 Over a year in the painting, they’re finally done, the last of my CB Gallic foot. They weren’t terribly urgent, which is why I put them away for most of this year after starting them; I got their shields done in August then did no painting for a few months, so it’s with a certain amount of relief that I’ve finally finished them. They’re not the last CB Gauls I could do; I’ve got a 3Cv element that would be useful as Galatian or Gallic mercenaries with various armies. 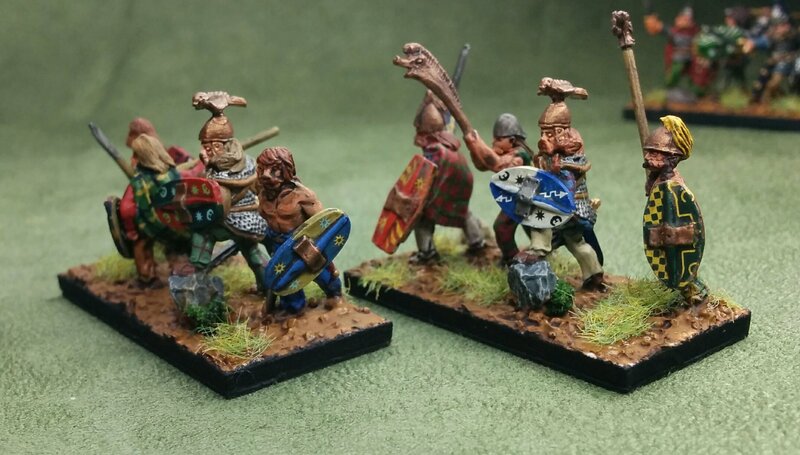 And as I like painting CB figures so much, I’m sure their Numidians will creep up the priority list after the Mithridatics are done (especially as I’m looking at Sallust’s Jugurthine War again). The four new foot, who will be serving with the Carthaginians and Syracusans. The Mithridatics are moving on well. Their cavalry’s over half done, as are the 4Ax and 2Ps. I’ll do the 4bd as a separate group, though I’ve made a start on some of them. That way I can field one version of the army faster. I made an amusingly obvious discovery this morning. I can put the metallic paper on the bases before I put the figures on! It’s easier (blindingly obviously so! ), but as I was in the habit of adding the paper to finished elements, that was the habitual order of things and it’d not occurred with me to do it differently!